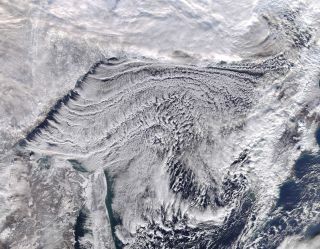 The Moderate Resolution Imaging Spectroradiometer (MODIS) aboard NASA's Terra satellite acquired a true-color image of frigid air blowing over the Sea of Okhotsk on Nov. 25, 2017. Space observations are crucial to solving the challenges presented by Earth's complex climate, which will play a pivotal role in humanity's success or demise, argued an extensive report by the U.S. National Academies. The new, 700-page report released today (Jan. 5) is titled "Thriving on Our Changing Planet: A Decadal Strategy for Earth Observation from Space." In it, the National Academies of Sciences, Engineering and Medicine (NASEM) announced their recommendations for what federal research agencies — such as NASA, the National Oceanic and Atmospheric Administration (NOAA), and the United States Geological Survey (USGS) — should do over the next 10 years. This was the second decadal survey for Earth science and applications from space; the first was published in 2007. "There is a perspective from space that cannot be gained any other way," Abdalati said early in the press conference. Understanding the ways in which human activity and non-anthropogenic changes are shaping societies across the world ought to be considered like an extension of infrastructure, he added. Gauging weather systems and predicting sea-level rise, for example, are as vital to a "thriving" society as fixing highways and maintaining railroads. "If you go back 10-12 years, we were in a different place when it came to Earth information from space" Abdalati said. "We were not using weather apps on our phones and planning our days' activities around them. We were not using online mapping applications to get to and from where we're going in the most efficient way. The military [also] relies heavily on information from NASA, NOAA and USGS." Space observations are crucial for society in a myriad of ways across the commercial, public health and national safety sectors, the co-chairs said. The report is the product of 290 suggestions of the most important issues to tackle in the near future, contributed by the scientific community. From those suggestions, the report's compilers extracted 103 objectives and then synthesized them into 35 final goals. The report calls for prioritizing advances in, for example, forecasting air quality and weather so that predictions provide a lead time of up to two months. In addition, the report calls for knowing how biodiversity changes over time, predicting future geological hazards within a more accurate time frame and understanding more precisely how the ocean stores heat, among many other goals. The report recommends that NASA cap the budget for its current projects —both flying and soon-to-be-flying missions —at $3.6 billion, to leave room in the agency's funding to serve the report's 35 objectives over the next decade. Abdalati stressed, however, that it was important to fly the missions already in development. NASA should also continue studying how small particles of material, known as aerosols, can affect air quality and should learn more about the traits of vegetation on Earth's surface, the co-chairs said. The report additionally suggests that NASA start a competitive new Explorer program for medium-size agile instruments and missions (with a budget of $500 million or lower), in which participants would take a shot at addressing one of seven identified topics from the survey. Those topics include mapping ocean-surface winds and developing 3D models of the terrestrial ecosystem. The competition may also reveal what objectives will be more easily achieved in the next decade, Gail said. Gail concluded his presentation by addressing the report's title. "It really is about this tension between our ability to thrive over the next decade and longer, and the fact that as the planet is changing around us, the information we need to acquire about our planet is changing as rapidly as we try to acquire it," he said. "So this will be a decade in which we will find growing community and public reckoning between two things: broad reliance on Earth information ... and this growing challenge of obtaining that information."